Kiros Seagill (キロス・シーゲル, Kirosu Shīgeru) is one of Laguna's comrades in the Galbadian Army. He wields a pair of katar (कटार) or gauntlet-daggers, with which he repeatedly slices his enemies in his Limit Break, Blood Pain. His weapons' name is given as "katal" in the English localization of the game. Following the failed mission in Centra, Kiros is separated from Laguna and Ward. He heals quickly and decides to leave the Galbadian army, but soon finds that life without Laguna lacks excitement. His subsequent search for Laguna brings him to Winhill after nearly a year. When Laguna is forced to leave Winhill to find Ellone, Kiros accompanies him, helping him earn money as an amateur actor to fund the expion. Kiros remains by Laguna's side throughout his adventures in Esthar, earning a place as Laguna's advisor when he becomes president. Like Ward, Kiros' interactions with Laguna are based on the staff's interactions during development. The cast itself has received criticism from reviews. Lundigran criticized the manner in which romantic interactions play out, stating that "considering that the love story is so integral to everything that happens—not to mention forming the central image of the box art—it's incomprehensible why no one says 'I love you' to anyone, ever". 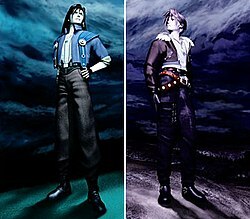 With Squall, he felt that "FFVIII does break one cardinal rule: when your story is character centered, you'd better center it on a character the audience can care about. Squall, unfortunately, just doesn't fit the bill". 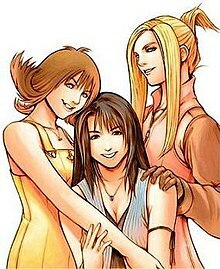 However, GameSpot felt that Final Fantasy VIII shifts the story from the "epic" concepts of Final Fantasy VII to the "personal", in that "the characters and their relationships are all extremely believable and complex; moreover, the core romance holds up even under the most pessimistic scrutiny". A later orial by IGN's Ryan Clements echoed this sentiment, appreciating that Squall and Rinoa's single kiss during the finale serves "one of the player's main rewards for hours of dedication". Although the reviewer at Official U.S. PlayStation Magazine acknowledged possible fears over a romantic storyline, he stated that "it's only later in the game, once you are really attached to all the distinct and complex characters, that the more emotional themes are gradually introduced".